We ran a very successful Orkney Dialect Poetry Competition at the start of this year. You can read the winning poems on this site, or by clicking here. The judges were Donna Heddle, Tom Rendall and Harvey Johnston. 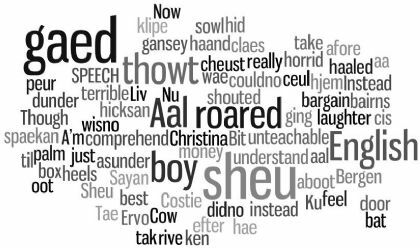 Meantime, there is still information on this site to do with Orkney's dialect, particularly the information pack which we put together for entrants to the competition, which is still available for download by clicking here. "Speech" by Christina Costie as you may never have seen it before! Make your own wordle by clicking on the picture above, or by clicking here.